The Legend of St. Edmund. Edmund was crowned king of East Anglia on the 25th December 855 probably at Bures St. Mary in Suffolk. In 870 the Danes advanced on East Anglia and killed Edmund. Legend has it that he was killed on the 20th November 870 (although some record this as 869), in a place called Haegelisden, local tradition believes this to be Hoxne. When hiding from the Danes, under a bridge, his presence was given away by a newly married couple who spotted his golden spurs gleaming in the water. After being captured he refused to renounce his faith and was tied to an oak tree, was beaten, shot with arrows and then beheaded. His head was thrown into the wood. Edmund's followers found his body but his head was missing. Whilst they were searching for it they heard a cry of "here, here, here" and traced the cry to a wolf who had Edmund's head between his paws. His head and body were reunited and buried nearby, a wooden chapel being built over the spot. 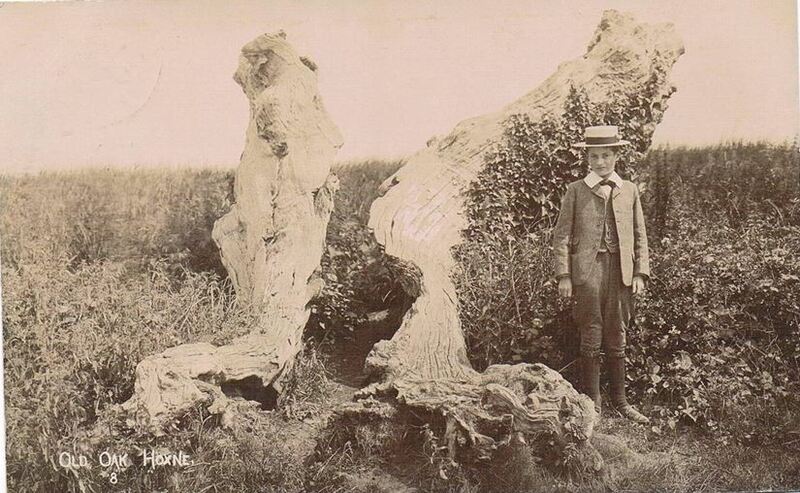 On the 11th September 1848 St. Edmund's Oak fell to the ground under its own weight. The trunk was only 12 feet high up to its separation into branches, but measured 5 feet in diameter and had a circumference of 20 feet. The trunk producing about 7 and a half loads of timber and its limbs about 9 loads and its branches 4 loads of battens and 184 faggots. Inside the trunk, at about 5 feet from the ground and a depth of about a foot, was found a piece of iron which appeared to resemble an arrow head. Presumed to have been lodged there at the murder of King Edmund. The piece of wood, with the arrow head in it, is at the Moyes Hall Museum in Bury St. Edmunds in their store room. Several items were made from the tree including a chest that was once at Flixton Hall before the house was demolished and the contents sold. Also a carved screen for Hoxne Church, which was removed when the organ was resited but is shortly to be restored. A Dining table 5ft wide that could be extended in length to 15ft was also said to have come from the tree. It was made for General Kerrison's son and daughter in law at Brome Hall. An oak chest held the additional leaves and legs. Sir Thomas Tacon, and his daughter, purchased the table with Brome Hall in 1920. And it remained there until the sale in 1953. The whole table was put together in the dining room for viewing days by Eric D King and his father. Eric King's father came to Brome Hall as Head Gardener and Chauffeur in 1920 and was with Miss Maud Tacon until 1952. 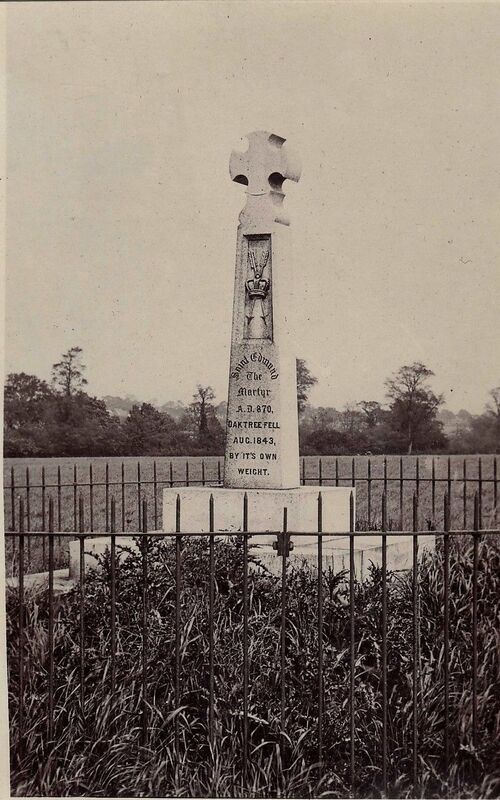 A monument was erected on the site of the fallen oak by Sir Edward Kerrison. Possibly erected some time after 1848 although some accounts say that it was erected by his son Sir Edward Clarence Kerrison as late as 1879. However a newspaper report, of the 1st November 1878, describes it as a stone monument surmounted by a Maltese cross. It bore the inscription "St. Edmund, King and Martyr, Nov. 20th AD. 870, oak tree fell August 1848, by its own weight." On the 27th June 1905 there was a severe thunderstorm and the monument was badly damaged. Portions of the shaft were scattered many yards away and the brick pedestal, on which it stood, was all that remained. Sir Edward Clarence Kerrison had died in 1886, but his daughter remained lady of the manor and commissioned the re-erection of the monument. In 1907 she invited tenders from Stone masons in London, Bristol and Diss. It was the local firm, Richard F. Perfitt of Victoria Road, Diss who was awarded the contract, undertaking to supply the cross in Aberdeen granite for £23 12s 6d. It was completed in 1908. From the above picture it is obvious that a mistake was made, giving the date as 1843 instead of 1848. Also, Edmund is just described as 'The Martyr' instead of 'King and Martyr'and it seems that both inscriptions got the month wrong giving it as August when it appears it was September. 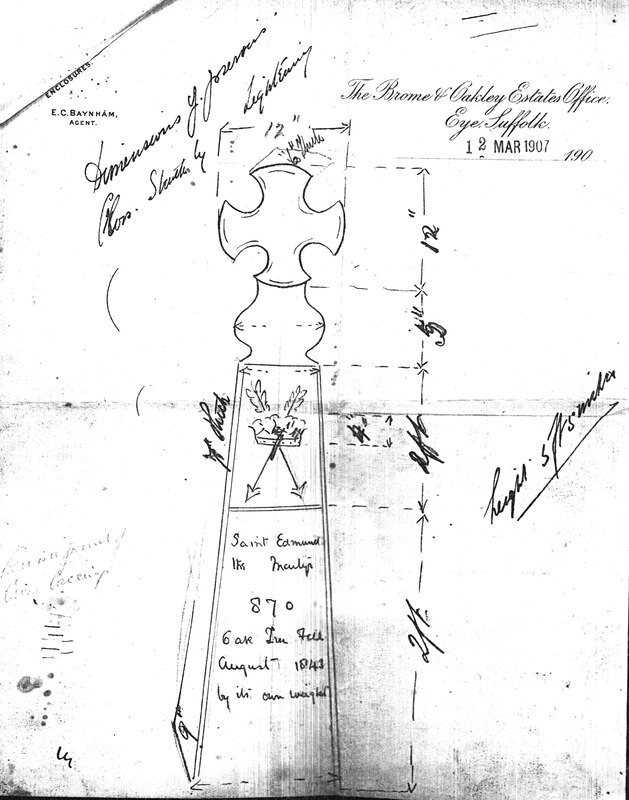 However it was not the stonemason's error as can be seen from Kerrison's Estate Agent's sketch below of the first cross. Perhaps the damaged cross was indecipherable? On the 24th December 2018 the monument was listed, Grade 2, in order to protect it for future generations.